PennsylvAsia: Zhang Yimou's The Great Wall (长城) at Cinema in the Park, August 16 and 19. Zhang Yimou's The Great Wall (长城) at Cinema in the Park, August 16 and 19. 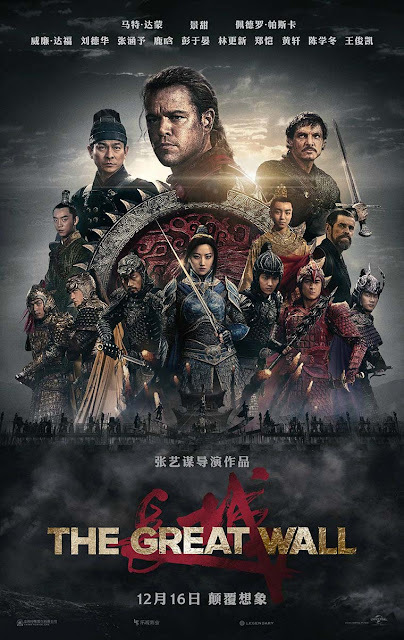 Damon plays William, an Irish mercenary who arrives at China’s Great Wall together with Spanish companion Tovar (Game of Thrones’ Pedro Pascal) just as it is besieged by a monstrous horde of Taotie – mythical beasts from the bowels of Hell, whom the Chinese believe were sent to keep their greed in check. Initially the foreigners simply wish to flee with as much explosive “black powder” as they can carry, but after earning the respect of Commander Lin (Jing Tian), newly appointed leader of the wall’s Nameless Order, William agrees to stay and help defend the kingdom. Early criticism that the film propagates the “white saviour” narrative and that Damon’s role was whitewashed both prove unfounded. William is a proficient warrior and willing collaborator, but it is Lin and Strategist Wang (Andy Lau) who discover the key to defeating the beasts and spearhead the pivotal assault. Cinema in the Park movies are free and open to the public, and begin at dusk.